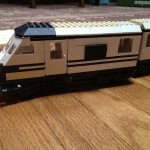 More old MOCs from my closet – this is a white rendition of the Metroliner. 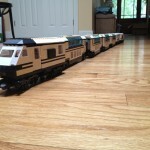 I built this around 1998 when I first got into 9v trains. At the time the Metroliner was selling for about $400 on the secondary market. There was no way I was going to pay that sort of money for one so I decided to build my own in a different color scheme. This train ran on some of the early NCLTC train layouts but I got a real Metroliner not long after I built so it basically went into mothballs. My rendition of the Club Car is pretty similar, there are a few minor differences but nothing substantial. The rest of the train is very different. At the time, 6×28 black wagon plates didn’t exist so I used the 6×24 version and “shortened” the train accordingly. The real hard to find element in my train is the White Train Sloping Front Top which came in only one set, 6557 Treasure Hunters. 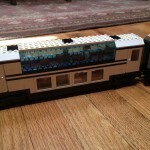 The 6557 set is rare, there is no price guide history on BrickLink. 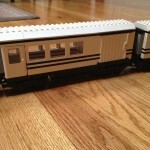 The white train front itself sells for $20 used! I should revisit this train and update now that black wagon plate is available in 6×28 (although only in the Maersk Train). Over time I’ve also picked up a couple White Slope 45 6 x 6 Double / 33 (Train Roof) so I can do the roof properly too. 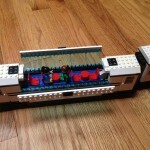 This entry was posted in NCLTC, Odd and Ends, Sorting, Storage, Trains and tagged Exhibit, NCLTC, train layout. Bookmark the permalink.